The Persian conquest of Jerusalem and the Holy Land in 614 represented one of the crucial episodes and high points of the last great war of antiquity between Sasanian Persia and the East Roman/Byzantine empires (603-628). The purpose of this monograph is to explore the roots of the core elements of the Byzantine religio-political programme which were conceptualized in reaction to this event, a programme underpinned by the evolving synthesis of late Roman/Byzantine eschatology and imperial ideology. Portrayed as a victory for Roman/Byzantine Christianity, Emperor Heraclius´ famed restitution of the True Cross (c. 630) clearly marked the symbolic climax of his Persian campaigns and this programme which had major repercussions for medieval Christian political theology and ideology of warfare in both Eastern and Western Christendom. Starting with a summary of the latest approaches to and various controversies surrounding the Sasanian conquest archaeology of Jerusalem and Palestine in 614, the monograph proceeds with an analysis and re-assessment of the areas in which Heraclius' religiofication, justification and conduct of the war after 614 differed from earlier Eastern Roman-Sasanian Persian conflicts which also displayed discernible religious aspects. 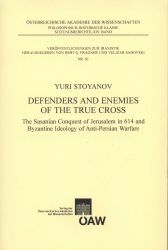 By highlighting and reconsidering the significance of the Jerusalem dimension for the Byzantine theology and ideology of anti-Persian warfare, especially in the intensification of Byzantine wartime propaganda, the monograph traces and sheds new light on the conceptualization and proliferation of apocalyptically-inspired Persophobic and Judaeophobic notions and imagery during the war, which were to have a lasting and influential Nachleben in medieval Christendom.